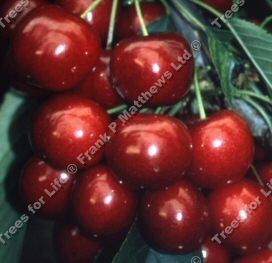 Buy Sweetheart Cherry tree online from UK specialist suppliers of garden fruit trees. Sweetheart (Prunus avium 'Sweetheart') is a result of the cross of cherry varieties Van x Newstar. First introduced in Canada in 1990. A heavy cropping variety, the cherries have an excellent flavour. One of the later picking varieties but well worth the wait as fewer cherries are available in the shops at this time. Ripens unevenly to spread the season. A good pollinator. Self-Fertile/Not Self-Fertile: This cherry is self-fertile and will give Sweetheart Cherries without the need of another cherry tree nearby however your harvest maybe improved by having one close by.